When I first showed you this cute little pouch last Saturday, one of you commented about it, calling it a ‘nappy pouch’ since that’s what you call baby diapers in the UK. I think that’s adorable! So that’s what I’m naming it and I hope it doesn’t cause any confusion here in the U.S. - I’ll be sure to always be clear what it’s for, lol. This is the perfect last minute baby shower gift because it’s even quicker to sew up than my Big Pocket Baby Clutch that I designed a few years ago. On the other hand, this sleek & simple pouch with a handle on the back could also be used to carry a journal or other small books, toiletries, or even lunch! The handle design allows the weight of the items inside to be carried from the back, instead of pulling the flap open when you pick it up. Oh, and don’t let me forget to tell you that it’s entirely fat quarter friendly! Tip: I love using Kam snaps because you can get so many awesome colors, but I lost my handheld Kam snap setter years ago. I bought the Babyville/Dritz one at Joanns and it works perfectly with the Kam snaps that I already have. Use a bowl or plate with a diameter of about 11’’ to round off the top edges of the 17’’ x 9’’ pieces of fabric and stabilizer (the back/flap pieces - all 3). 1. Baste the exterior fabric pieces for the back/flap and tote front to the matching pieces of stabilizer, sewing 1/8’’ away from the edge. Or fuse in place if using fusible fleece. 1. Fold the ends of the 2 1/2’’ x 21’’ strip to the wrong side by 1/2’’ and press. 2. Fold the strip in half lengthwise, press. Open and fold the long edges to the center and press. Fold in half again and press. 3. Topstitch around the entire strap, sewing 1/8’’ from the edge. Tip: using a walking foot makes sewing straps like this much easier. 4. Use a pencil or fabric marking pen to draw a line on the handle 6’’ from either end. 5. Pin the strap to the back/flap piece through all layers as seen in the photo above. The ends of the strap should be 4’’ above the bottom of the piece. The sides of the strap should be 2’’ away from the sides of the piece. 6. Sew each side the strap in place with a 6’’ long x 1/2’’ wide rectangle (sewing over the topstitching and across the lines that you made 6’’ from either end). 1. Place the two 9 1/2’’ x 9’’ fabric pieces right sides together and sew along the top edge (one of the 9’’ long edges). Press the seam open and then fold the fabric wrong sides together and press the top edge flat. 2. Topstitch across the top of the pocket. 3. Place the pocket on top of the back/flap piece with the bottom edges aligned. Baste the side and bottom edges together 1/8’’ from the edge. 1. Mark and cut out a 1’’ square from the bottom corners of the flap/lining piece (with the pocket too). 2. 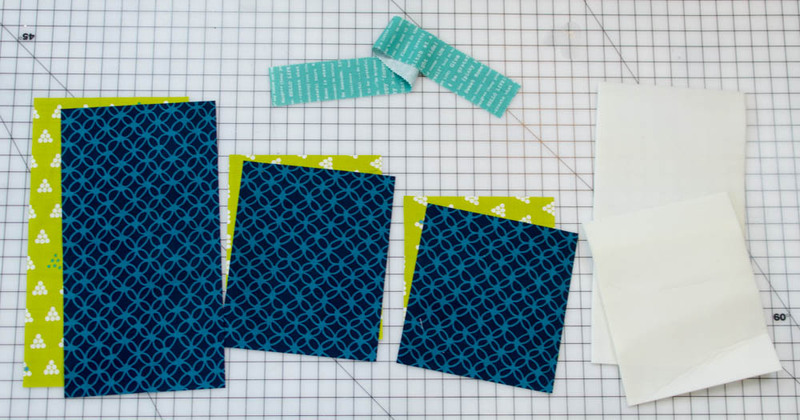 Repeat to cut out 1’’ squares from the bottom corners of all the pieces, exterior and lining. 3. Pin the tote front piece to the matching tote back/flap piece - for both the exterior and the lining, as seen above. 4. Use a pencil or fabric marker to draw a dot 1/4’’ from the corners of the top pieces (as seen above right). 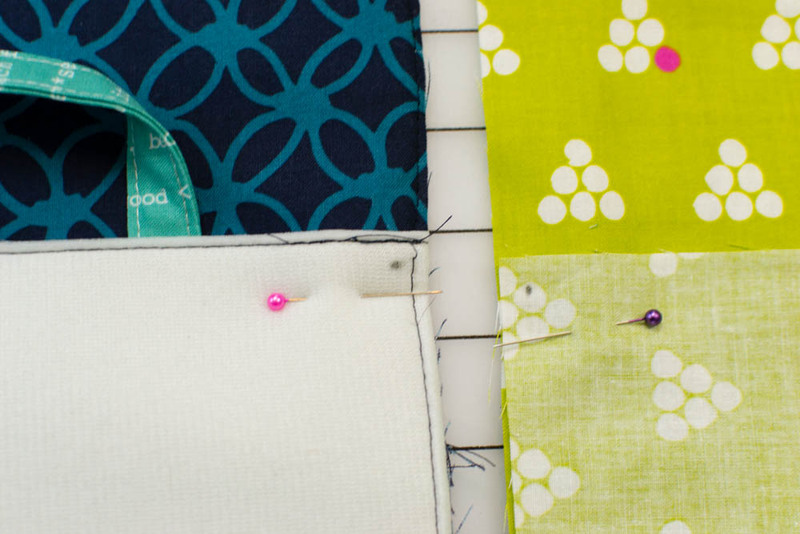 These dots show you where to start and stop sewing. 5. Sew the exterior piece: start at the dot in the top corner and sew down one side to the cut out square. Backstitch and cut threads. Then sew all the way across the bottom. Finally, sew up the remaining side - stopping at the dot. Backstitch and cut threads. 6. Sew the lining pieces together the same way, except leave a 4’’ opening at the bottom for turning the tote right side out later. 7. Flatten the corners, lining up the side seam with the bottom seam. Pin. For the exterior, make sure that the fabric pieces are laying smoothly (not stuffed down inside) and will be caught in the seam. Sew across the straight edge. Repeat for all 4 corners - 2 on the exterior and 2 on the lining. 8. Clip to the stitching at the seams where you sewed to the dot or started at the dot. Clip on both sides of both the lining and the exterior. 1. With the tote exterior right side out and the lining inside out, place the lining over the exterior, matching up the seams. Pin around the top edge. 2. 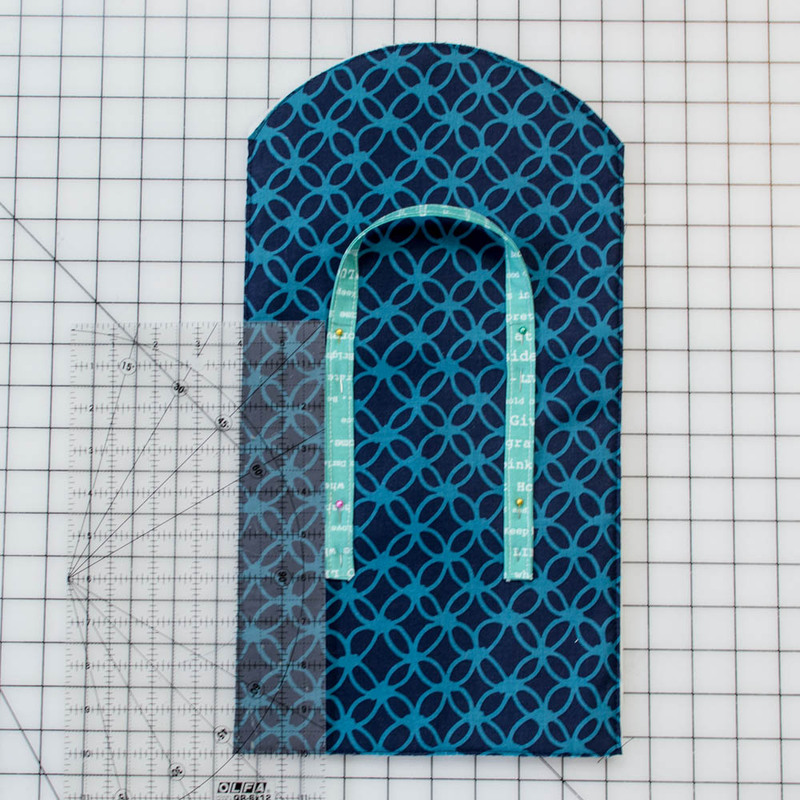 You will first sew around the top curved edge of the flap, stopping and starting at the dots as before - but sewing around the top instead of the bottom. 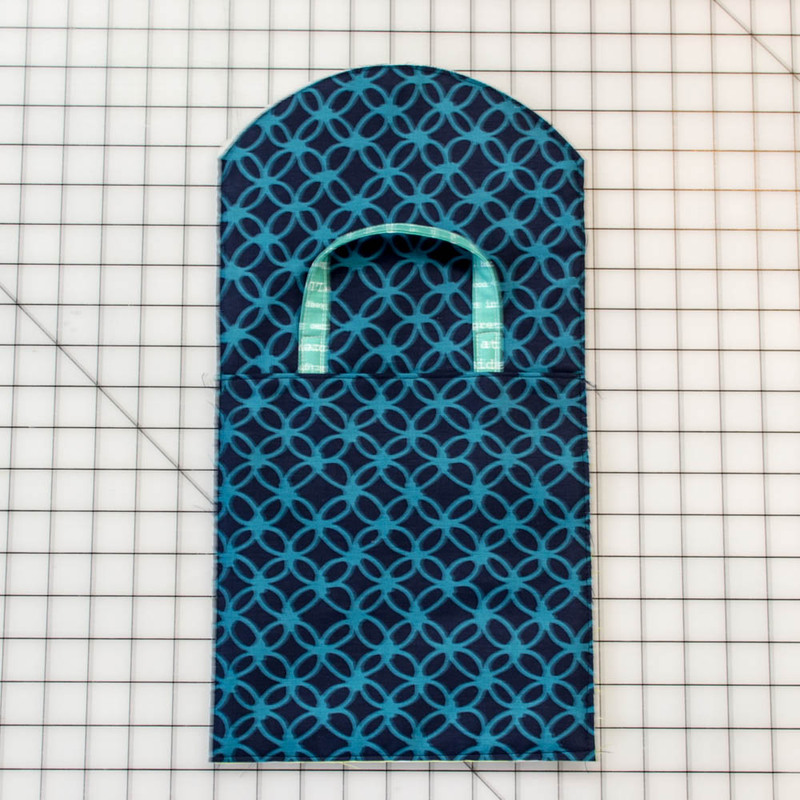 Keep the front part of the tote exterior and lining out of the way as you sew. 3. Then pin and sew the front edge of the tote lining and exterior together, sewing from dot to dot as before. Use the free-arm feature of your sewing machine (if possible) to help you keep the tote back and flap out of the way. 4. Clip away the extra fabric from the corners of the flap so that it will turn nicely. Turn the tote right side out through the opening in the lining. 5. Press the raw edges at the opening to the inside. Sew the opening closed either by machine or by hand. 6. Tuck the lining inside and press the entire tote carefully. Topstitch around the opening 1/4’’ from the edges. 7. Mark the placement of the snap pieces centered, and 1 1/2’’ below the top of the flap and the top edge of the tote front piece. 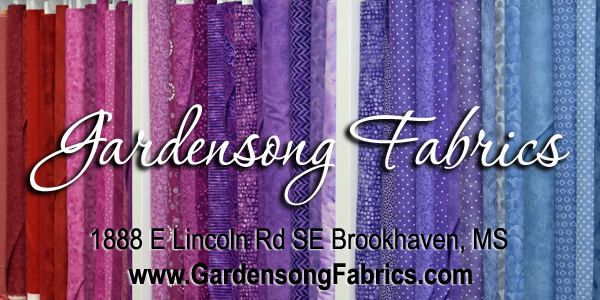 Apply the snap parts using a snap press, or sew on velcro or a button and buttonhole. 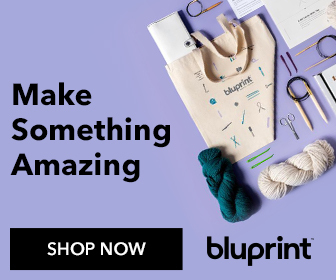 Fill with baby supplies and give to a new momma! Or with journalling supplies and give to a teen girl, or fill with toiletries to stay organized on your next trip! 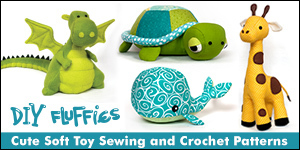 Make sure you also check out my list of 25+ Easy Gifts to Sew.